The recipe to make delicious waffle. In a bowl mix all the ingredients and pour the batter on the waffle machine. That's amazing! Ingredients: 2 eggs; 2 tbsp green onion, sliced; 2 tbsp cooked chicken, chopped; 2 tbsp tomato, chopped; ¼ cup cheese, cut into cubes. 1.Whisk eggs with salt and pepper. 2.Add cheese, chicken, onions and tomato. 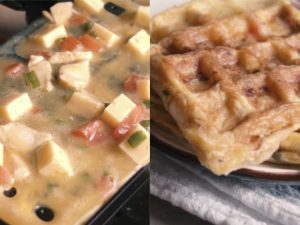 3.Pour omelet mixture into waffle iron and cook for 2-3 minutes or until golden on the outside. 4.Serve immediately with your favorite sauce. 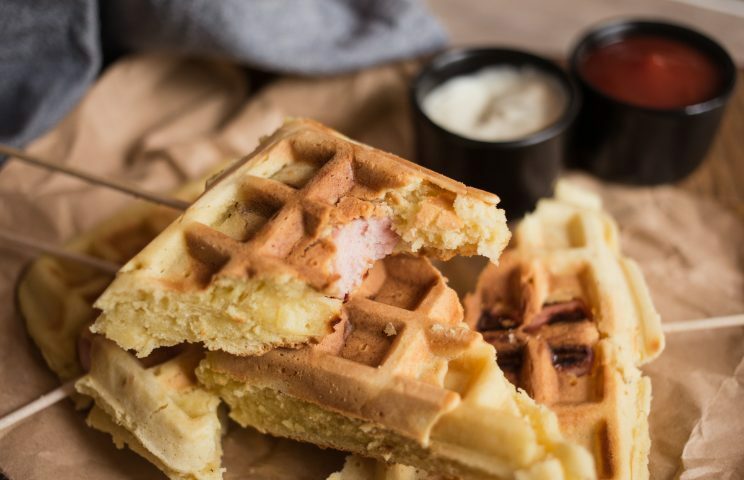 Try also this recipe: Waffle dogs: bring hot dog love to the next level! Ingredients: 1 cup cornmeal; 1 cup all-purpose flour; 1/3 cup sugar; 2 tsp baking powder; 1 egg; a pinch of salt; ¼ cup vegetable oil; 1 cup milk; 2 hot dogs; sauces of choice. 1.Mix dry ingredients (flours, sugar, salt, baking powder) together. Add liquids and egg, mix until smooth batter forms. 2.Cut hot dogs in half and skewer each half. 3.Pour batter into preheated waffle iron to fill it completely. Add half of hot dogs on top and pour more batter to cover them. 4.Close the waffle iron and cook waffle for about 7 minutes (depending on waffle iron itself) until golden and cooked through. 5.Cut each waffle in half, then make diagonal slice on each one to separate two hot dog halves as shown on the video. Serve with favorite sauce.